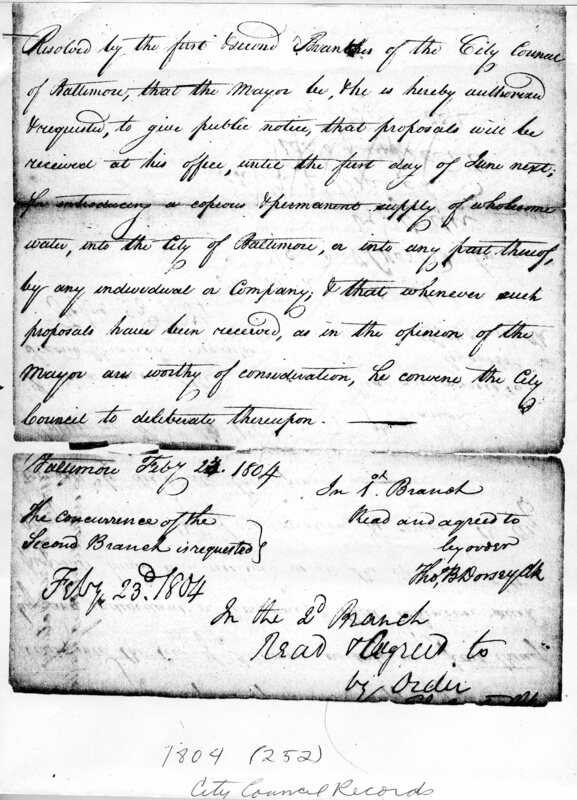 Resolved by the first and second branches of the City Council of Baltimore, that the Mayor be, and he is hereby authorized and requested, to give public notice, that proposals will be received at his office, until the first day of June next, for introducing a copious and permanent supply of wholesome water, into the City of Baltimore, or into any part thereof, by any individual or Company; and that whenever such proposals have been received, as in the opinion of the Mayor are worthy of consideration, he convene the City Council to deliberate thereupon. Baltimore Feb. 23, 1804 In 1st Branch read and agreed upon. Feb 23, 1804 In the 2nd Branch read and agreed to. 1804 Baltimore Water Company: On April 30, Samuel Smith, W. Cooke, E. Ellicott, Robert G. Harper, Thomas McElderry, Alex Mckim, and John E. Howard agreed to form The Baltimore Water Company. The Baltimore Water Company, a private company, furnishes water to a portion of Baltimore City. Company purchased parcels of land above and below the Belvedere Bridge, which crossed the Jones’ Falls, and built a dam and bought a lot at the southeast corner of Center Street and Calvert Street for the purpose of constructing a reservoir at that site. Water to this reservoir was supplied from the water at the dam by means of an open channel. The open channel ran between Calvert Street and the street known today as Guilford Avenue. 1805 Baltimore Water Company: The Baltimore Water Company receives an act of Incorporation.